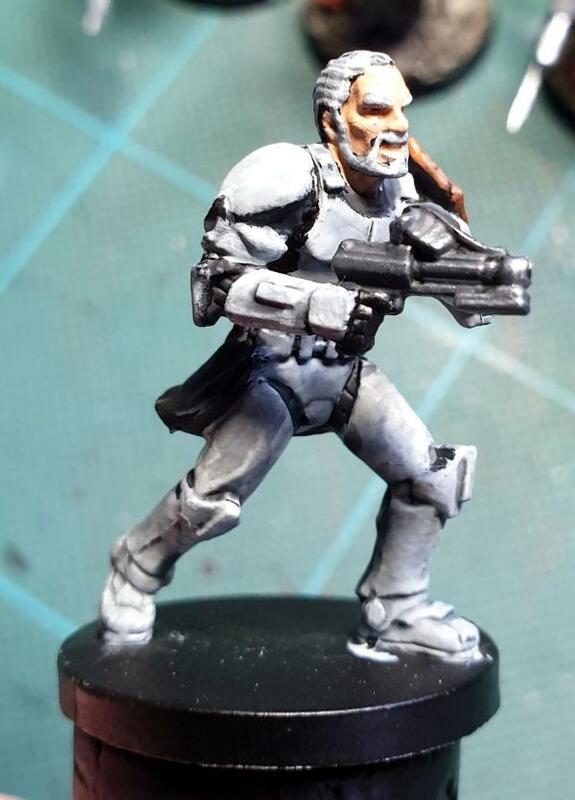 Streamed today, and cleared five models out of the queue - then started on a IG Heavy Weapon Squad. 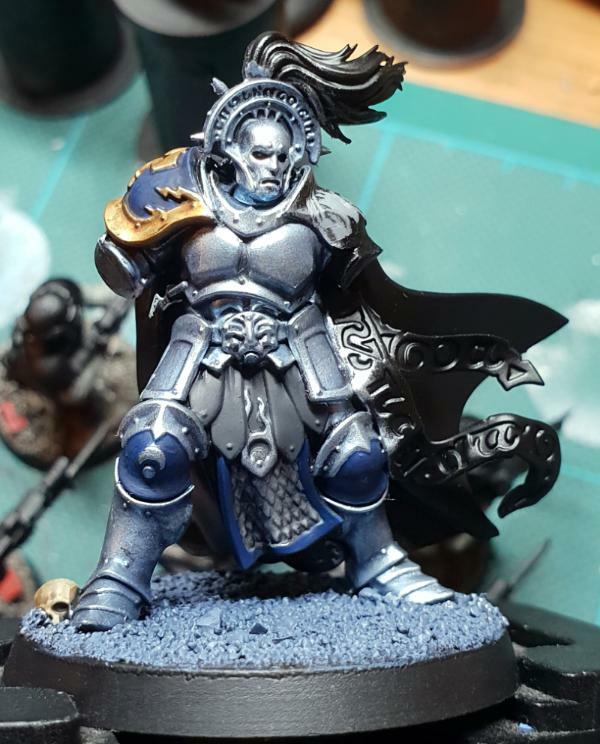 Knight Questor - Basecoated the armour with Miniature Paints Blue Steel, then washed it with Drakenhof Nightshade. 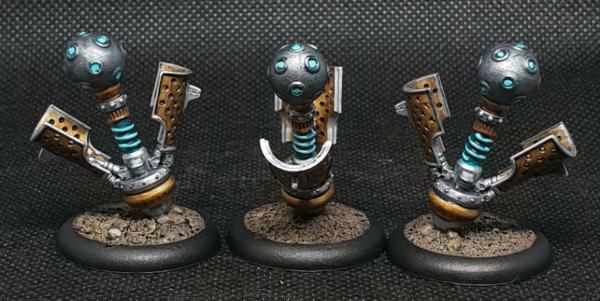 Steel Legion Heavy Weapon Squad - Started on the bases, with a first coat of Cryx Bane Highlight. Will do more work on the base before my next stream. 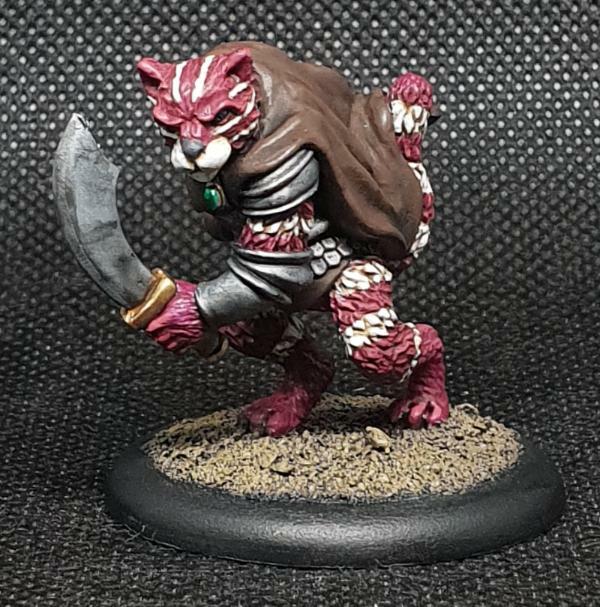 Bagpuss - Reviewed and tweaked the highlights on the white fur. Also touched up some chips on the leather pouch and fur. You sir, are a mad man! I applaud your efforts and hope you can achieve at least your primary goal. 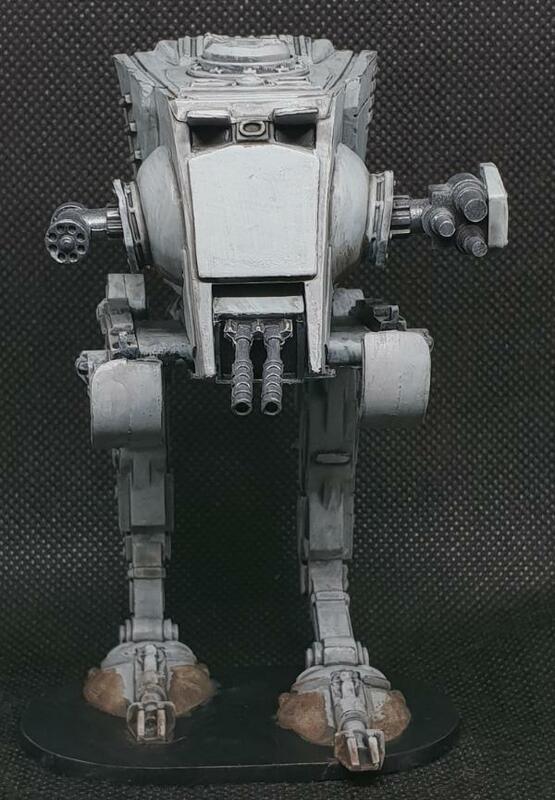 And seeing a completed one I am now in even greater fear of my 2 Imperial Assault AT-STs. 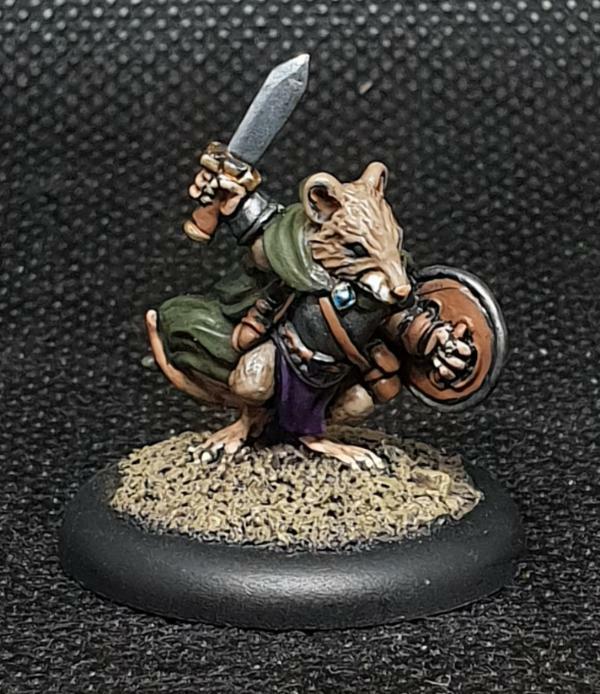 The mouse knight is the best. 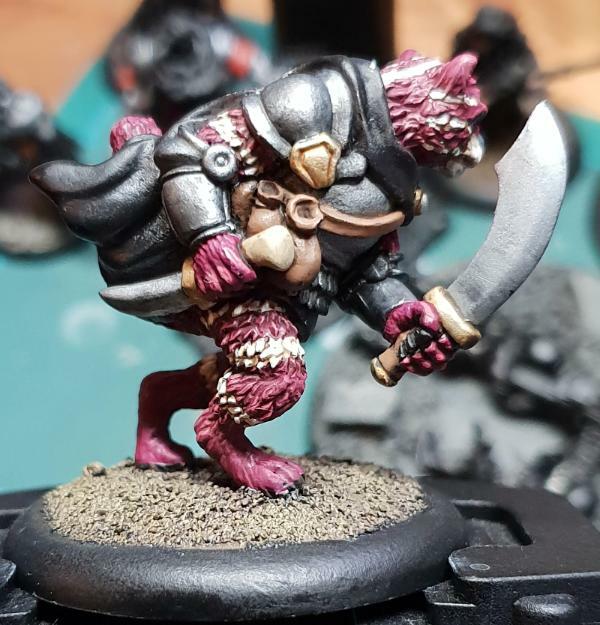 Keep up the battle against the unpainted...and resist the urge to get more models. 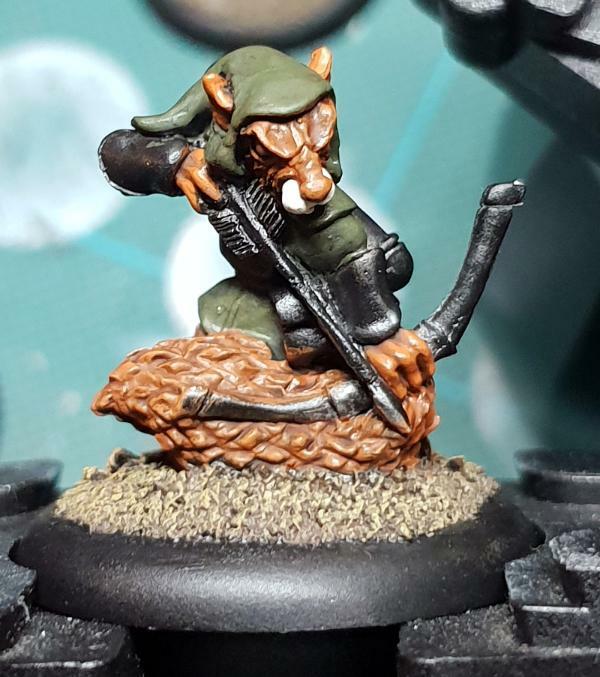 Check out my hobby thread here on Dakka! @ChaoticMind - Well, I never said I was sane. 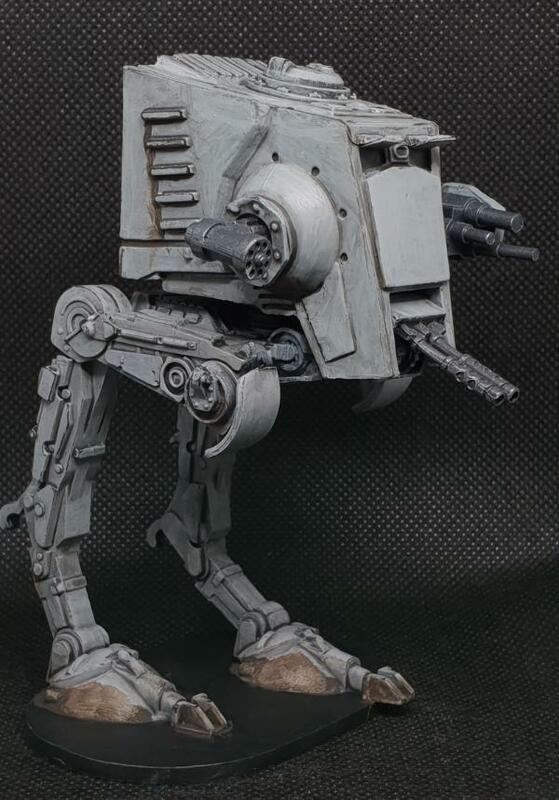 The AT-ST wasn't too bad to paint - in all honesty, it was how patchy the first coat of Celestra Grey was that put me off working on it more. Once I bit the bullet and sorted that out, it was OK.
@amazingturtles - Thanks. 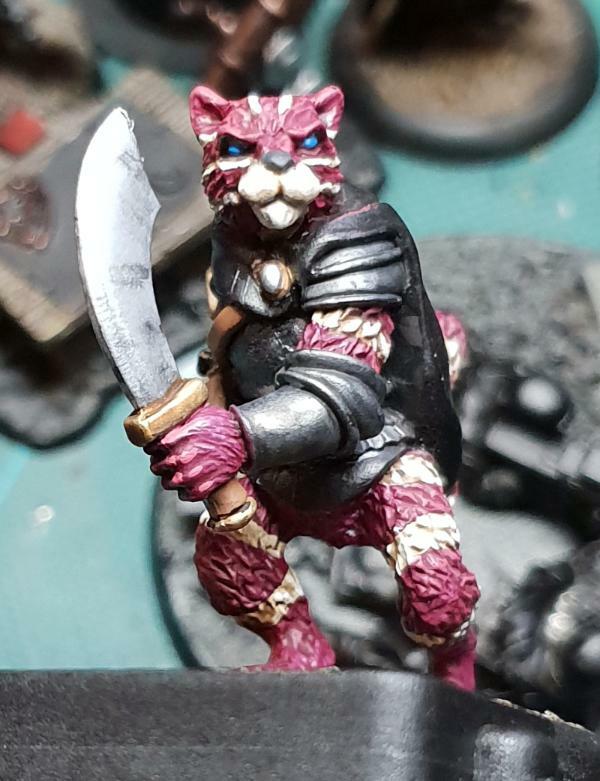 Though if you think he's cool, have a look at the finished Bagpuss, below. @Ezki - Thanks dude. I'm much happier with the booth now Tyranid Horde explained how I needed to tweak my process. Guess I'm redoing the pictures of the stuff I finished this year again. Anyway, I streamed last night, and got some more work done. Only one completion, but it was an important one. Also started four more models, which I think I should finish on Thursday. 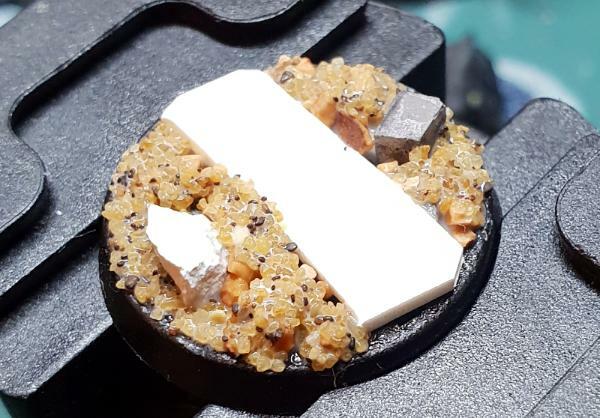 I need to edit the photos to go with it, but I should be adding a guide to how to make the ruined urban bases I'm making for my 40k models to the thread at some point this week. 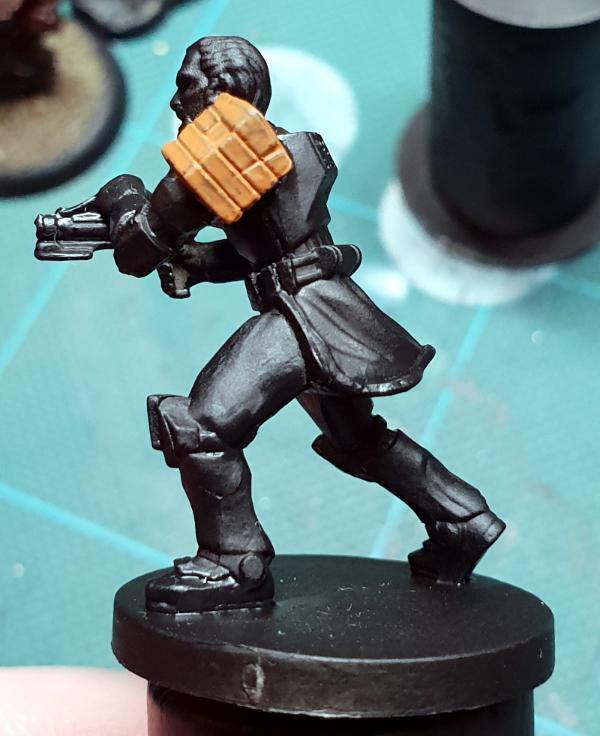 Steel Legion Heavy Weapon Teams - Finished working the bases up, picked out the trousers, boots and holsters, and washed things with Agrax. Greatcoats and details are the next step, along with deciding how I want the weapons to look. 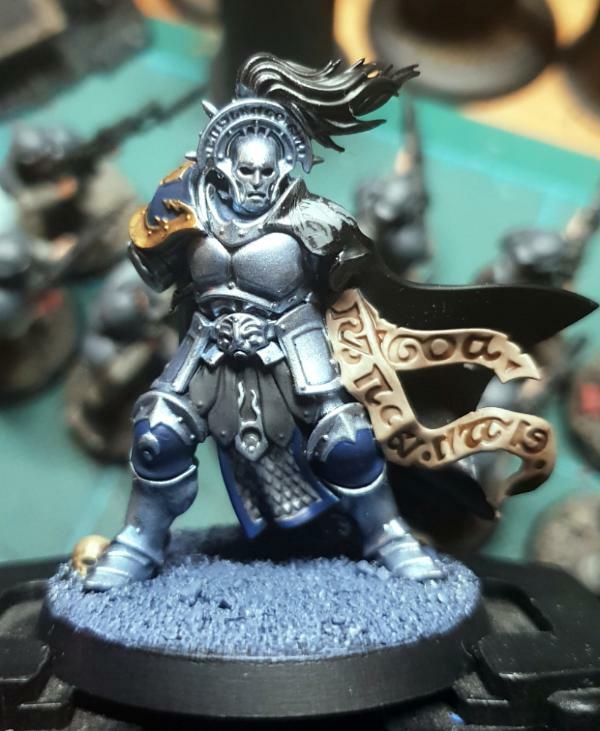 Knight-Questor - Applied two drybrushed highlights to the silver (the original Blue Steel, followed by VMA Chrome). 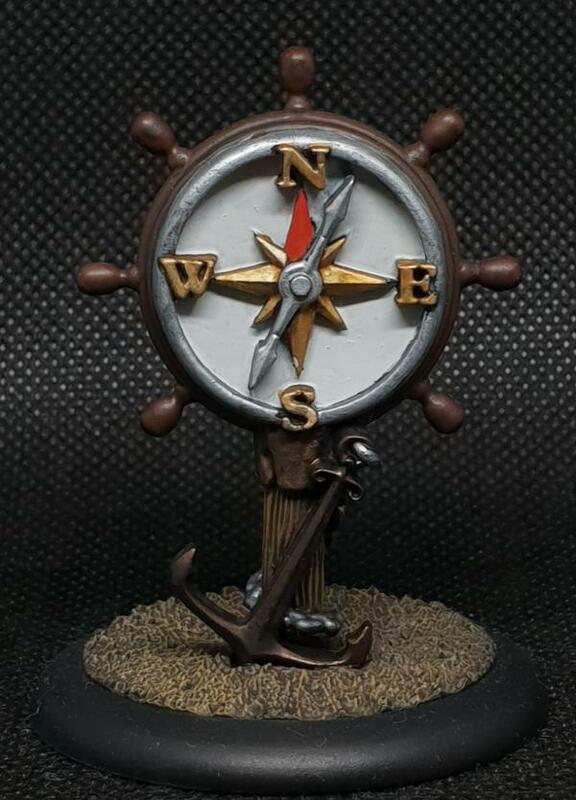 Painted the little scaled section with VMA Steel, and washed it with a Drakenhof/Nuln mix. Ready to basecoat the areas to be gold next, I think. 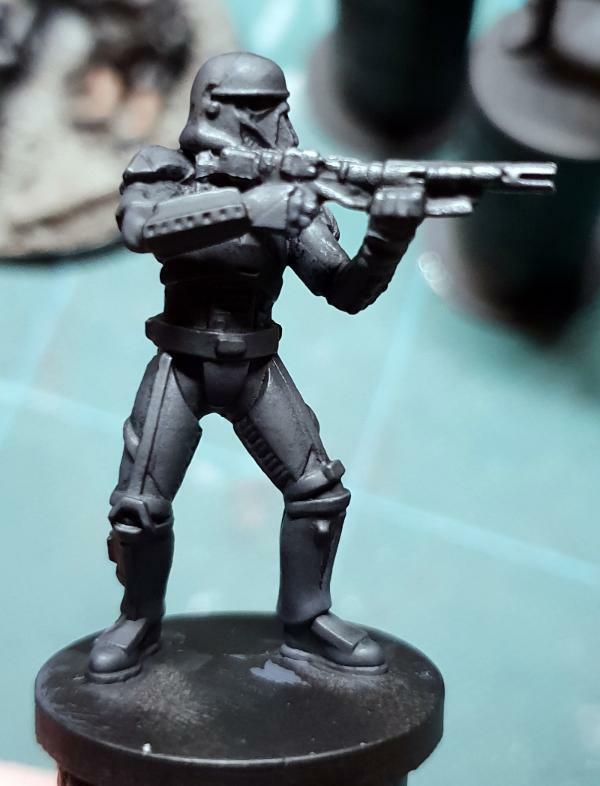 Imperial Assault Death Trooper - Essentially a taller Storm Trooper with black armour. 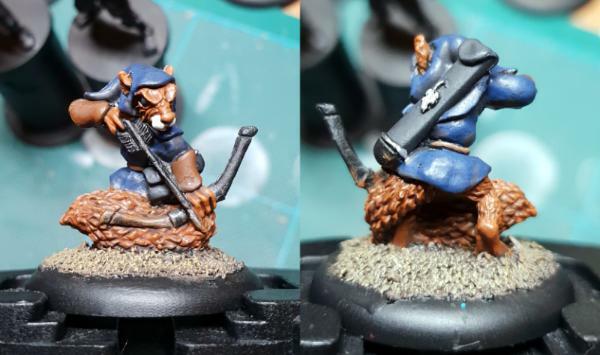 Basecoated with VMC German Grey, followed by a drybrush of a German Grey/Skavenblight Dinge mix as a highlight. 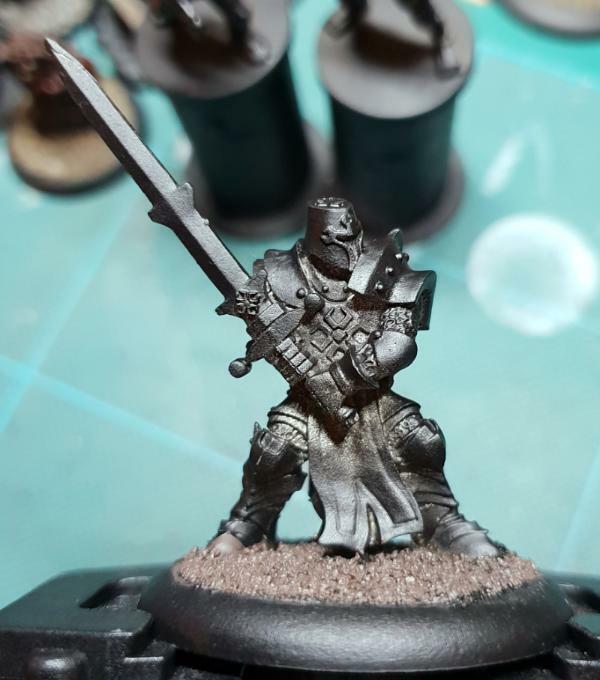 Drybrushed the weapon with VMA Gungrey. Washed the whole thing with Nuln Oil - will do a second coat on the armour plates before next stream, I think. Need to pick out some metal details, and they should be done. Nice those white stripes look awesome. Thanks Stormatious - as you can imagine, I was somewhat nervous when painting them on, especially around the head. Got a decent stream out of the way, with another four models completed. Still behind the curve, though. 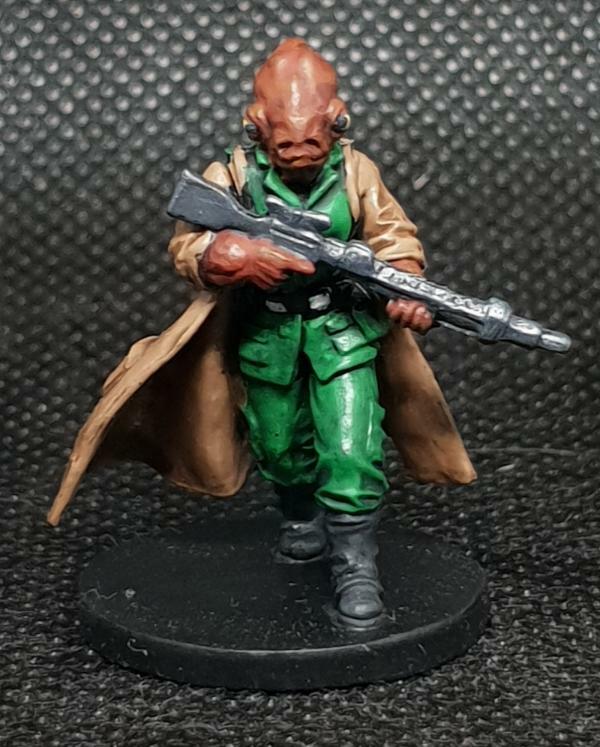 Probably going to prepare the Cloud City Wing Guard and AT-DP for Imperial Assault next, as well as more Poxwalkers and maybe the last 10 Cadian Conscripts for a unit of 30. Oh, and Lord Felthius, now my latest Conquest package rocked up. 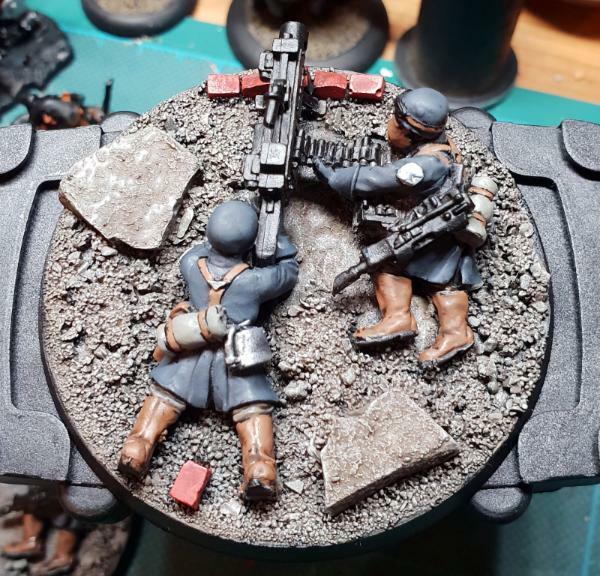 Steel Legion HWT - Based the coats and helmets with Greatcoat Grey, picked out the canteens with VMA Steel, and the strapping with P3 Bootstrap Leather. Also tidied the base edges up off-stream. 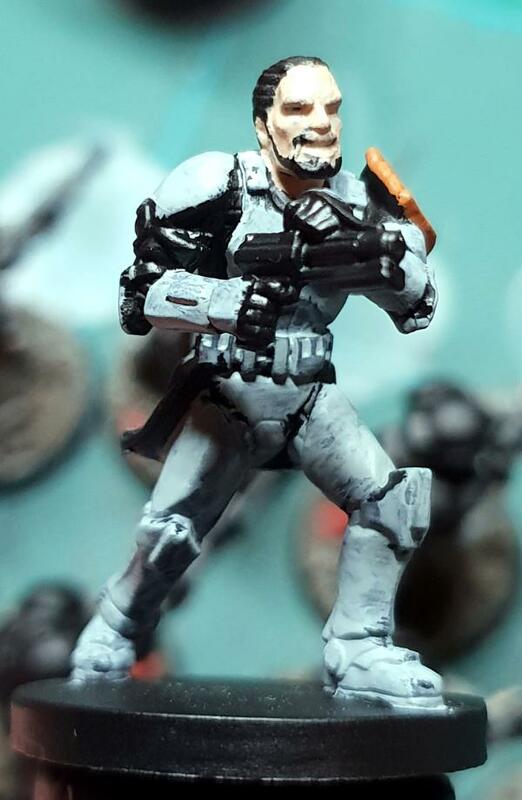 Death Troopers - Decided not to wash with Nuln again. Picked out metallic bits with Steel (which then got a blue/black wash) and used Waystone Green over Aluminium for the chin lights (which may or not be visible here). 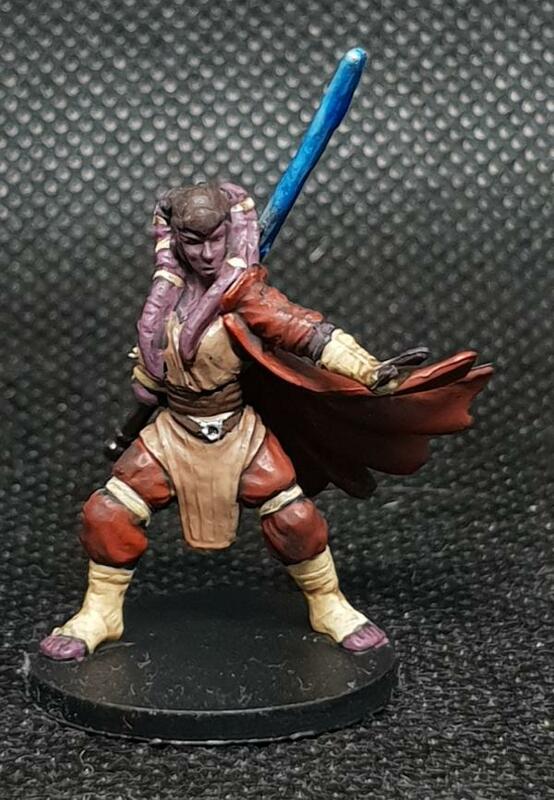 Keep fighting the for the painted models. 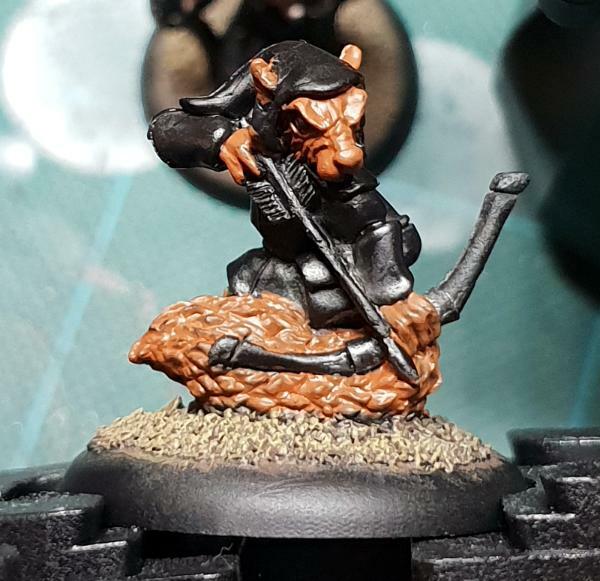 Squirrel Archer(s) - Worked up the fur on the Squirrel, with two drybrush highlights followed by a wash of Agrax Earthshade. 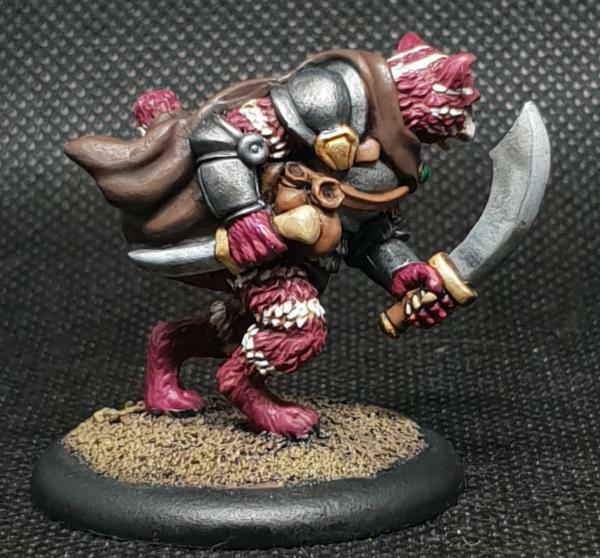 I might want to do a final highlight drybrush, but I'm not sure yet. 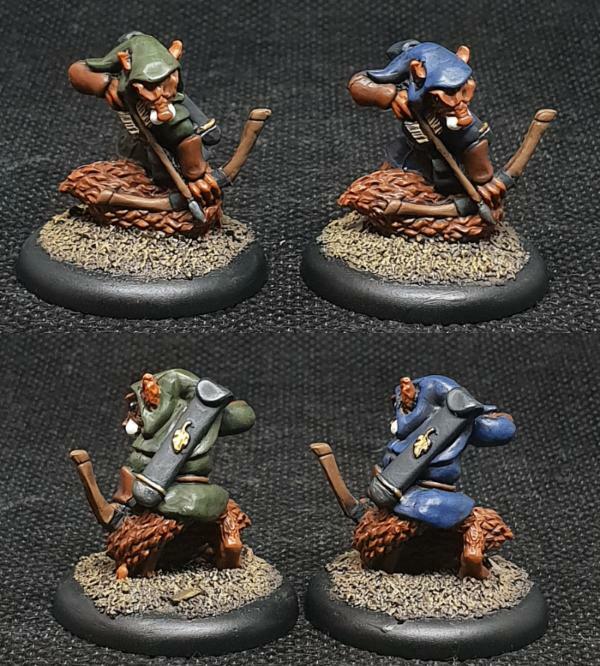 Steel Legion HWT - Washed the coats & canteen with a blue/black mix. Picked out the Y harness with Bootstrap Leather, with the buckle picked out with Steel. 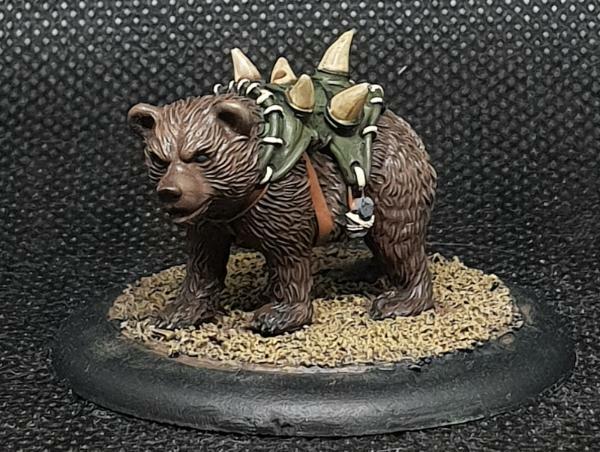 Used Cryx Bane Highlight on the bedroll, with Bootstrap Leather for the straps. 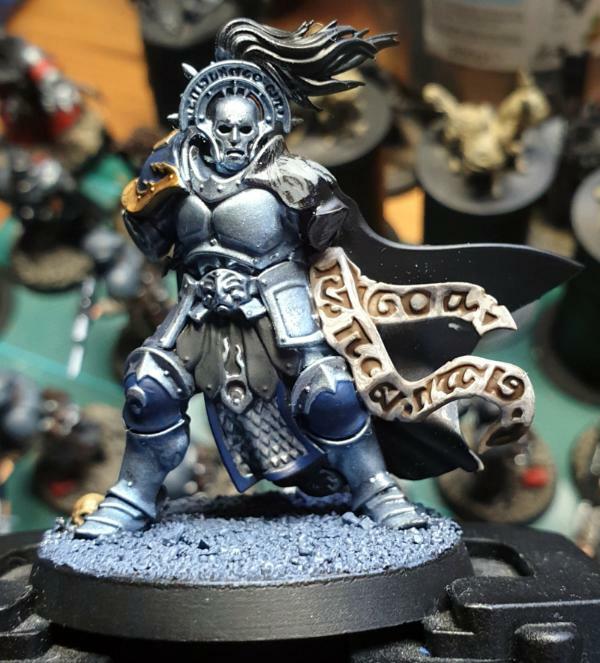 Finally, picked out the army badge with Celestra Grey, followed by Ulthuan Grey over it. 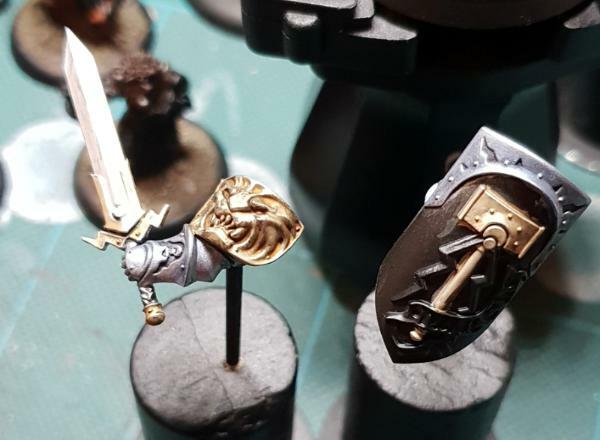 Knight-Questor - Applied more wash to the gold to improve the tone, along with Mournfang Brown on the handle of the sword. Happy with the gold now, at least. 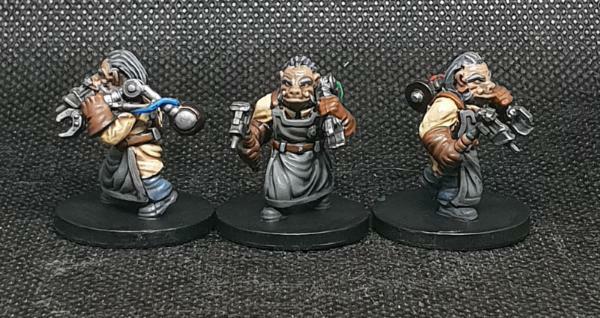 Ugnaught Tinkerers for Imperial Assault - Managed to knock these guys out in a day, having undercoated them on Saturday, and applied the final wash on Sunday evening. Didn't do all the work on stream, but got them done. Thanks for that, Orlando - hope to be working on some more of Grandfather's troops soon. 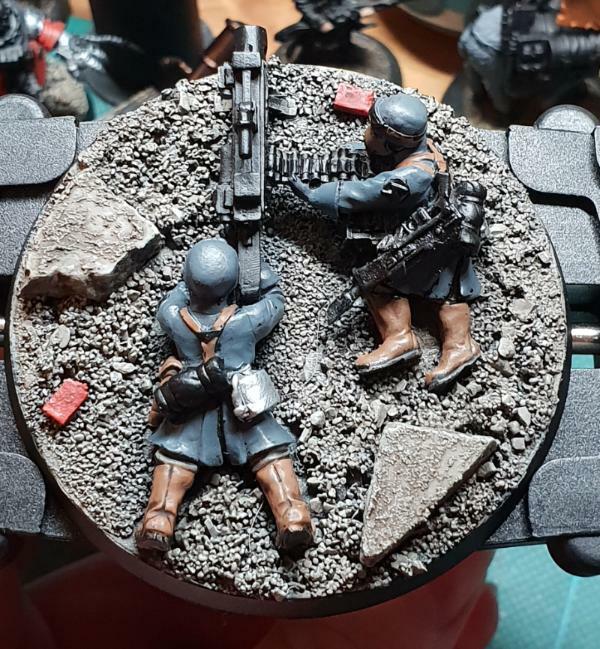 Last night's stream ran a bit longer than intended, mainly so as I could polish off the Steel Legion Heavy Weapon Squad - I was hoping to get further with the Wing Guard than I did, but I guess I can finish them on Thursday instead. 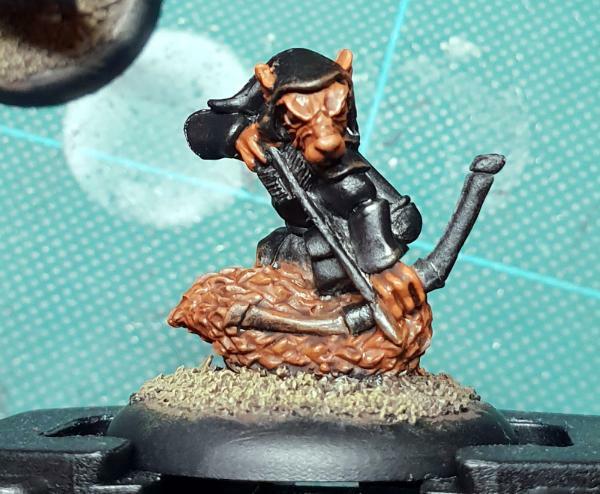 Squirrel Archers - Picked colours for the tunics on the two Archers - this guy is getting P3 Exile Blue as a base, while the other will get Citadel Castellan Green. Cloud City Wing Guard - Made a start on these, and didn't get quite as far as I'd liked. Need to finish basecoating the uniform with Calgar Blue, and do a second coat to smooth out out. May also sort out flesh before next stream, too. Some fun minis in here . 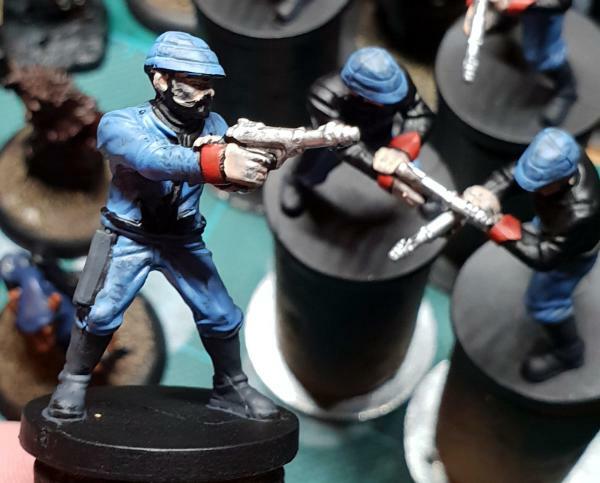 Steel legion squad is looking great! A quiet stream tonight, which means I was able to get my head down and get some work done. I was mainly focused on the Wing Guard, to try to polish them off. Didn't quite get there, as there was quite a lot of work to do, but I've definitely made progress, as well as starting three more models. 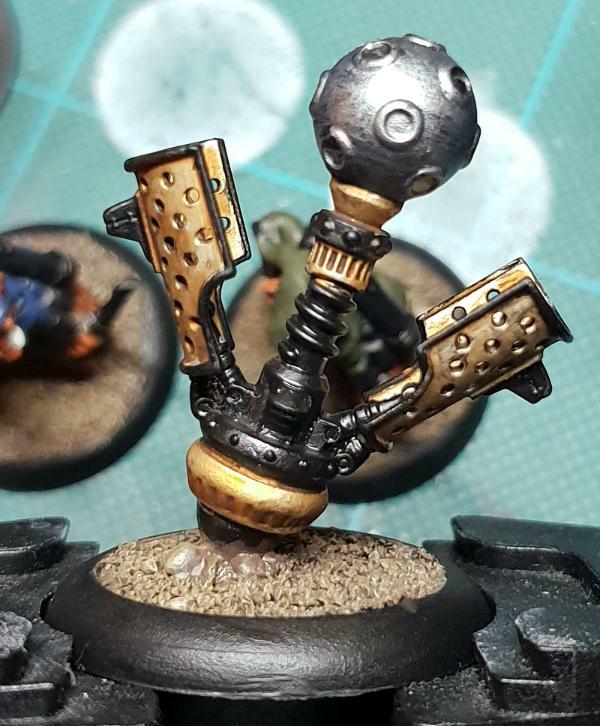 Cygnar Lightning Pod - This thing is mostly metals, with a bit of galvanic glow. Got the base down for the gold, along with two coats of sepia, as well as painting the base and basecoating the ball with Gungrey. 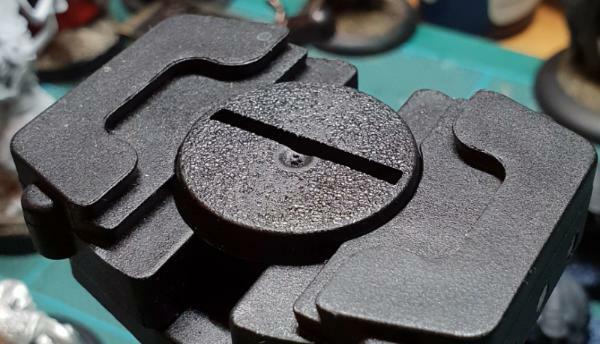 Other metal areas need basecoating with Steel. 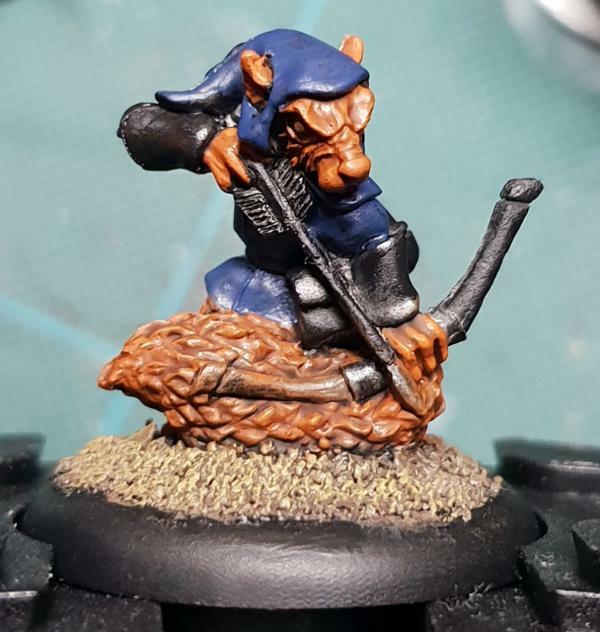 Squirrel Archer - Got some shading done on both Squirrels today, adding some shadows to their tunics. Also picked out the white area on their muzzle, in line with the previous ones I've painted. Might have to work the leathers in next. Cloud City Wing Guard - Had to do a lot on the Wing Guard today. The uniforms needed a second coat of Calgar Blue, before they were washed with Drakenhof. Skin got a second coat of Midlund Flesh, before being washed with Reikland. Boots and holsters were washed with Nuln. Finally, the yellow trim was picked out with P3 Moldy Ochre. Next up will be beards/hair and the shirt collar. Thanks Commissar - yeah, the Lightning Pod was bigger than I thought it would be, but suitably full of Cygnar galvanic technology. 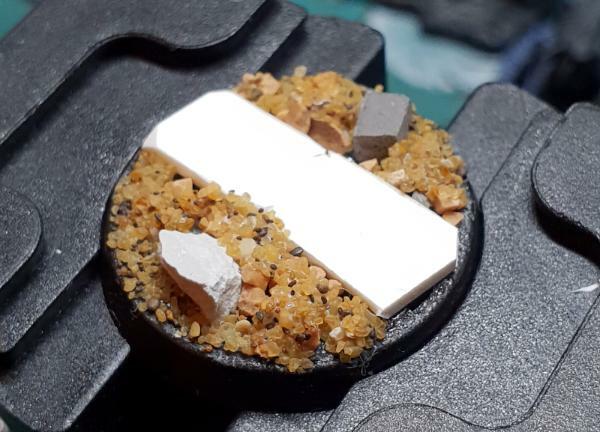 A while back I was talking about doing a guide to the bases I've been using for my 40k models so far - I finally got around to sorting the photos out, so here you go (spoilered for length). Making these bases is a fun process, and you can get quite a bit of variety with some simple components. 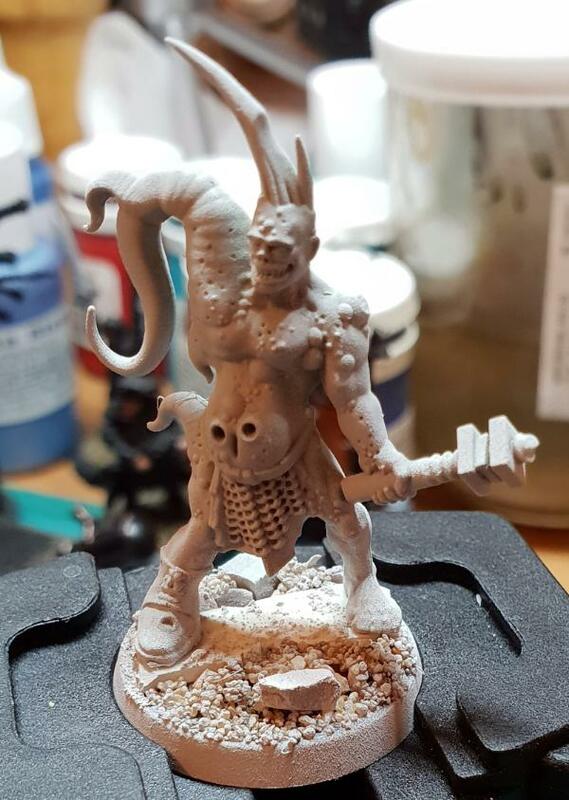 In this case, I'm basing a Poxwalker, so I'm making use of the 25mm base he came with. Clean up the point where it attached to a sprue on the edge, if required, and make sure the top is flat - the bases with a divot in them as an injection site may need a little spike trimming with a knife and file. 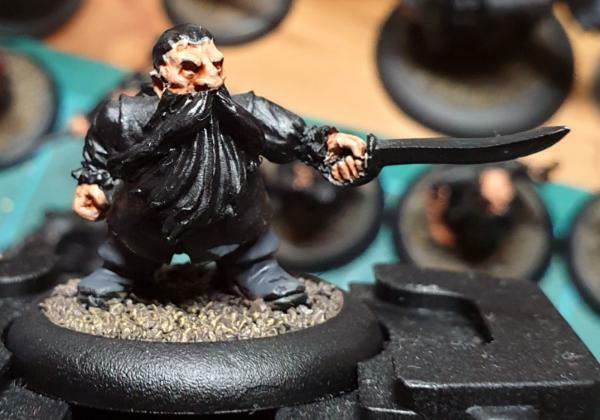 Most of the models I use this basing style on come with a tab on their feet - this needs to be carefully removed, and a file used to ensure the bottom of the feet is flat. 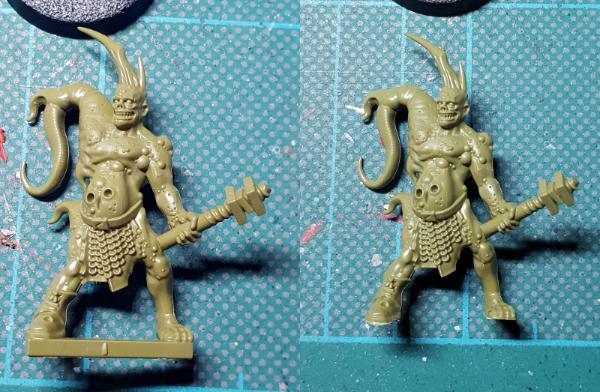 Ideally, the miniature needs to be able to stand up on its own. The next step is to add a piece of plasticard to the base. 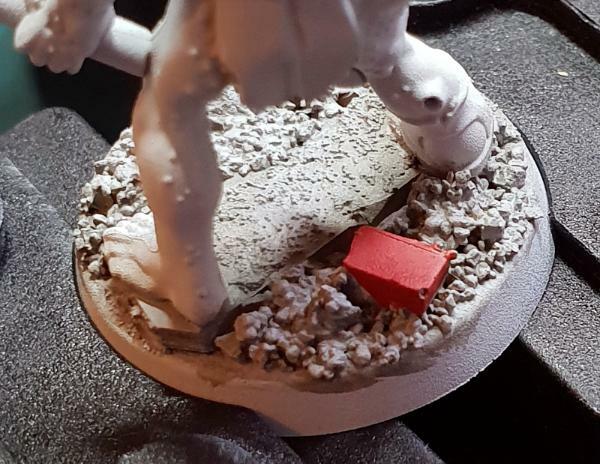 This isn't mandatory, and some models work without it, but as a general rule I'll add a piece as a contact area for the miniature's feet. For a 25mm base, I'll take a segment of plasticard 20mm wide, and use the model to estimate how deep the strip will need to be. Use poly cement to glue it to the plastic base. 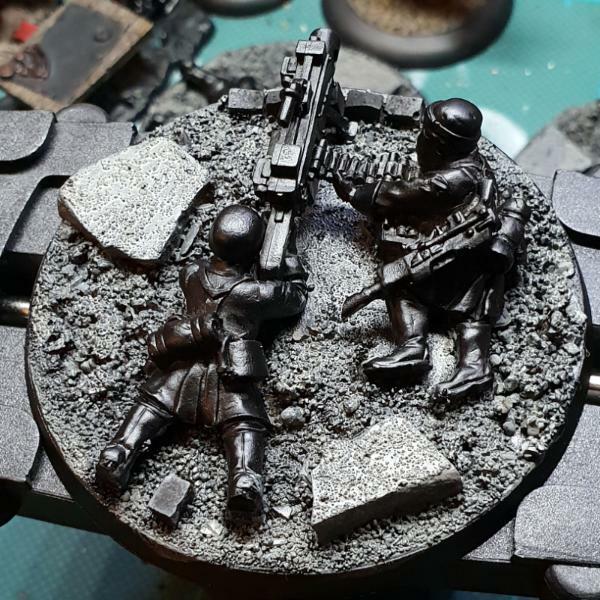 Keep the model to hand, as you will need to make sure that any elements you add to the base don't get in the way of adding the model to the base. 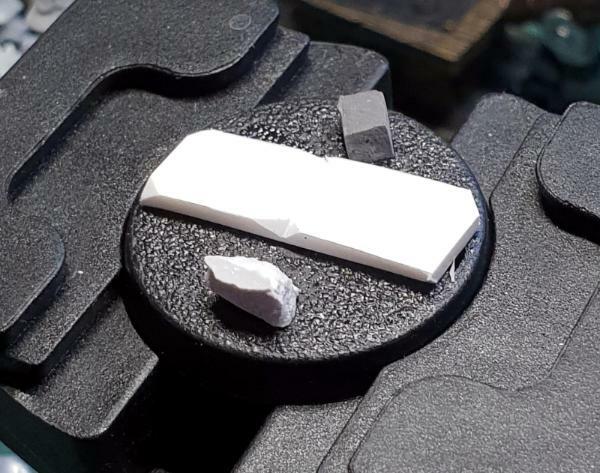 This step is where you can raid your bits box to add material to the bases. 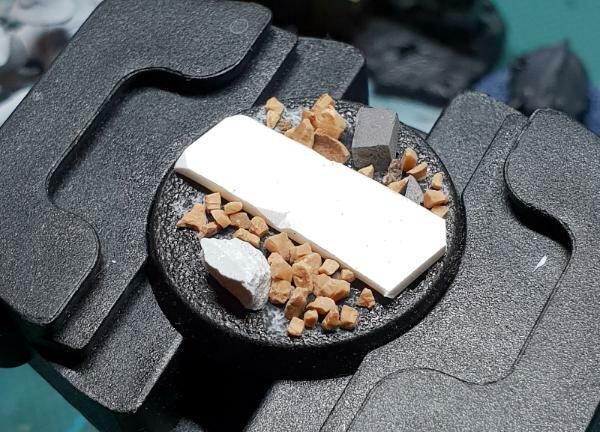 For most of mine, I use a piece of brick (cut down from a doll house brick) and some concrete rubble (from a tub of "concrete" rubble I got from Gale Force 9). 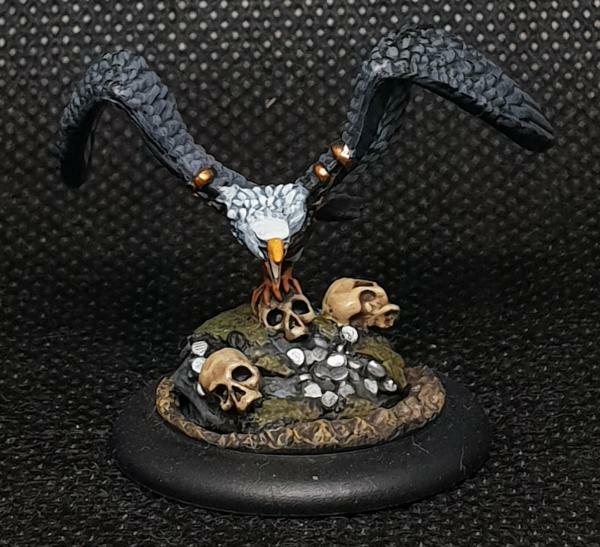 However, you can use anything thematic from your bits box to add interest - skulls from the Citadel Skulls box work quite well. Depending on the thing you're using, use superglue or poly cement to attach the pieces to the base. The obvious problem from the previous step is that the plasticard, brick and concrete don't blend in very well. To solve this, I use a medium ballast from Gale Force 9, using PVA glue to stick it to the base. I wouldn't necessarily glue it to the whole of the lower section of the base, but that is an option. The one problem following the previous step is how rough the texture is. To balance this out, adding finer surface texture, I apply sand over the top of the ballast, as well as on any areas I haven't glued the ballast down on. In my case, I'm using some bird sand I got from a pet shop, but any sand should do. PVA doesn't give the strongest bond, especially if you're going to be drybrushing the surface - which we will be. To help with this, I apply a layer of watered-down PVA glue over the top of the sand and ballast. 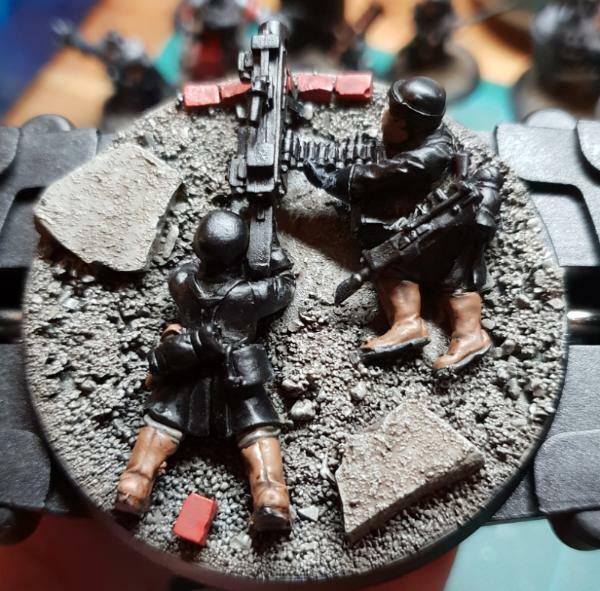 This can take a little while to dry, but I find it makes the bases more resilient. 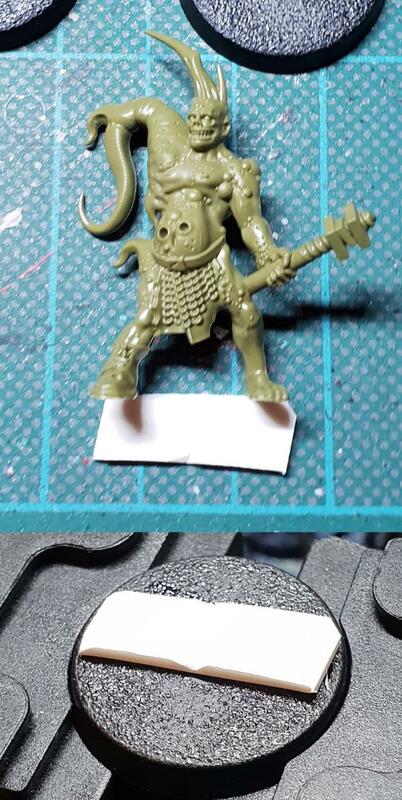 An obvious step, but one which is needed - if you're using a plastic model, use poly cement to glue the model down. If working with a metal or resin model, I'd advise pinning the model to the base, not just relying on a super glue bond alone. 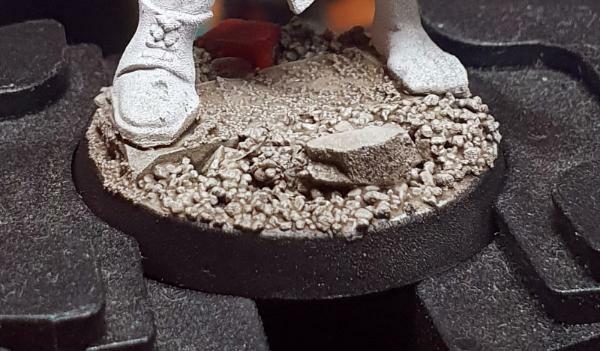 Finally, we need to add some texture to the surface of the plasticard (along with large sections of concrete on larger bases). 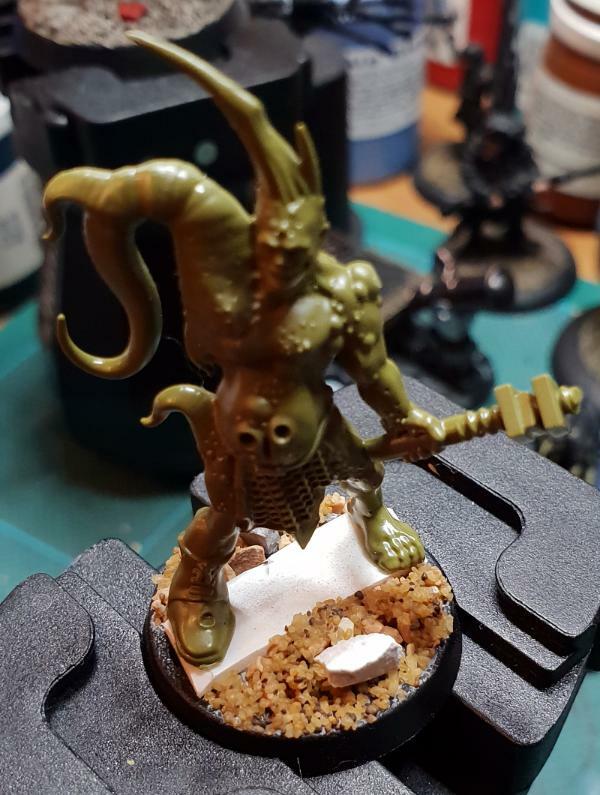 To fix this, I use some Vallejo Sandy Paste around the model's feet, taking care to avoid getting it on the miniature – this also works on the top of larger segments of concrete. 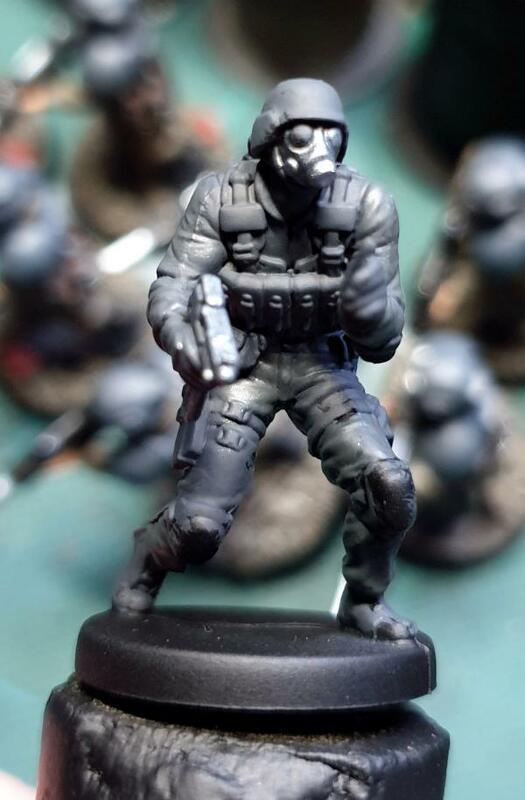 As a general rule, I normally undercoat with Citadel Chaos Black spray. 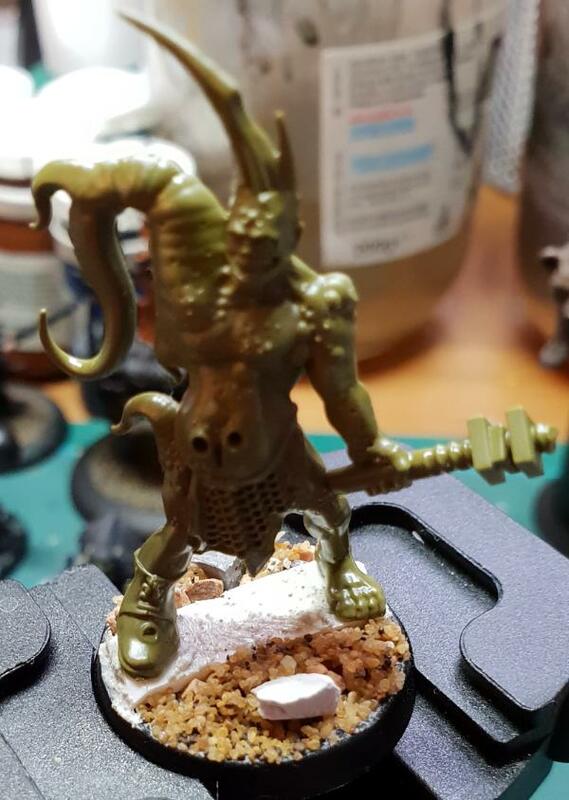 Of course, I'm painting a Poxwalker here, so I used Citadel Corax White spray. 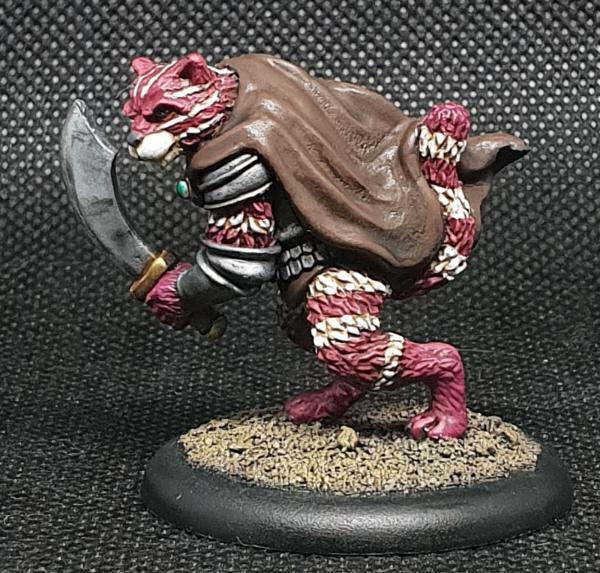 Regardless of undercoat, the paint approach is the same. If coverage is a little patchy on the base, I'm not overly worried about it. 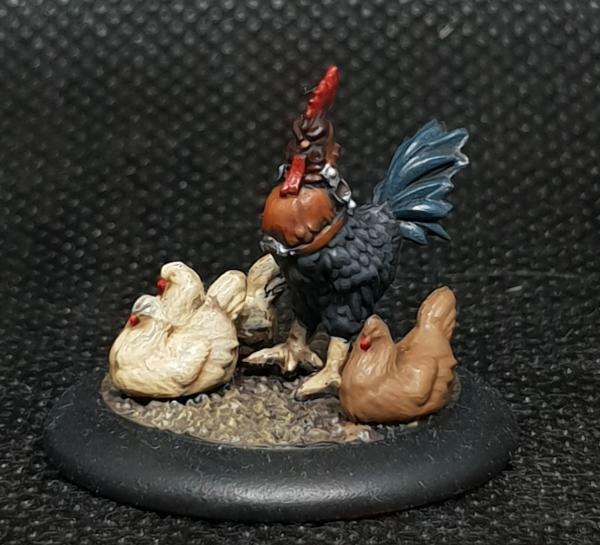 First step on painting the base is P3 Cryx Bane Highlight. I tend to use two thinned coats, in order to give a solid base of colour to work with. 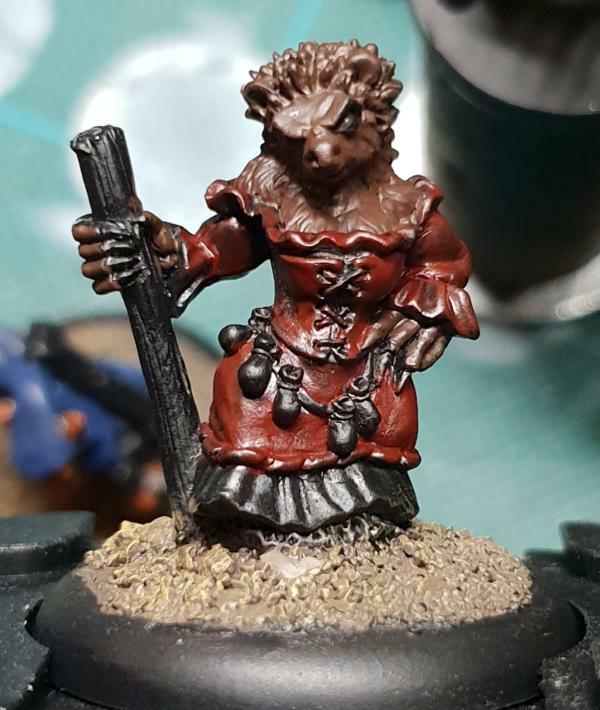 ...and here is where we enter Drybrush City. 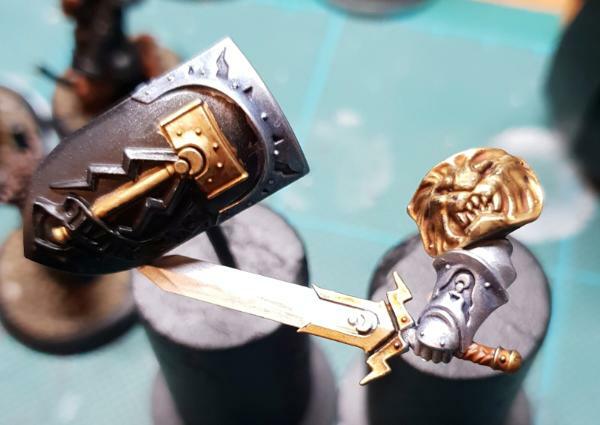 To highlight the base, I use two drybrushes - a reasonably heavy drybrush of P3 Trollblood Highlight, followed by a lighter drybrush of P3 Sickly Skin. This is where your colour choice will be determined by what details you added to the base. In this case, I've just got my brick to pick out. My choice of colour for them is P3 Skorne Red. 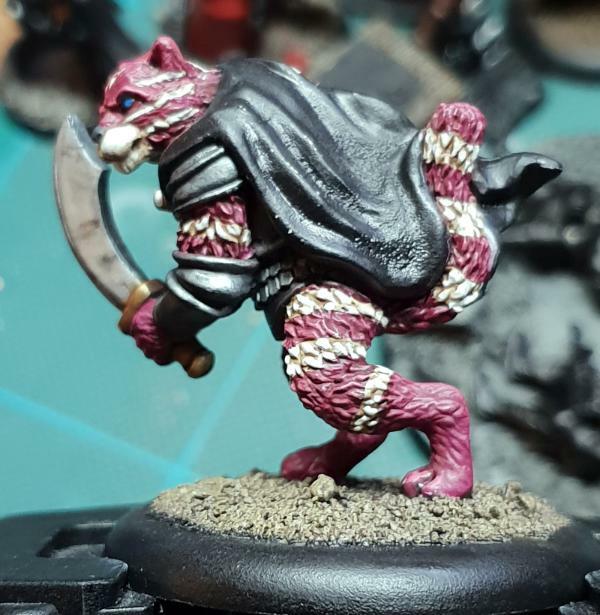 If you've added pieces from your bits box, use whatever colours are appropriate. Final thing is to tidy up the base, especially the outer rim. As I'd used a white undercoat, I first painted on a layer of Warcolours Black Undercoat, followed by a pass with Citadel Abaddon Black. 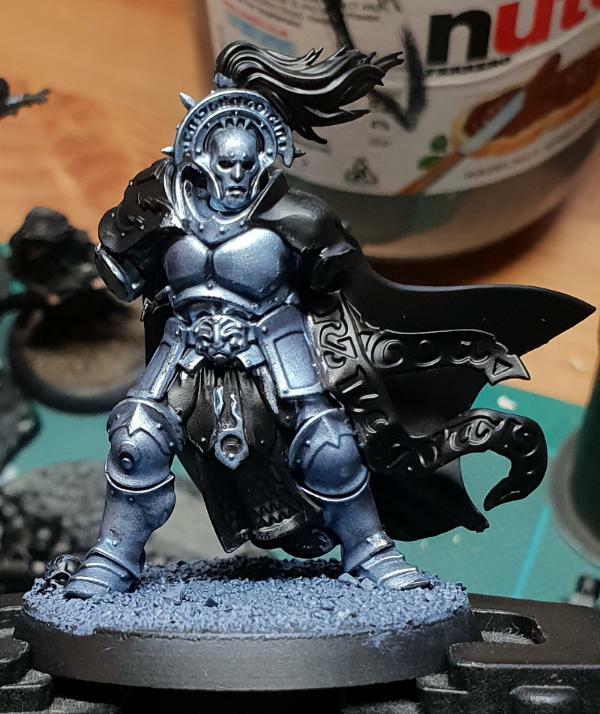 If I'm using a black undercoat spray, I just need to use the Abaddon Black layer. Hope it proves useful to you. Well for a bit there I thought I was keeping up...but with the Orks almost finished I am starting to fall behind as Guard take me longer and you are a machine. yeah the lightning pod is begging to be orkified, or used on a knight or something.. Lovely bit of it. Nice tutorial as well; why do you remove the tabs though? @CommissarKhaine - I remove the tabs because it works better when mounting the model on the base. In theory, you could omit the plasticard and use the normal tab, but it may lead to the model's feet being obscured on the base. 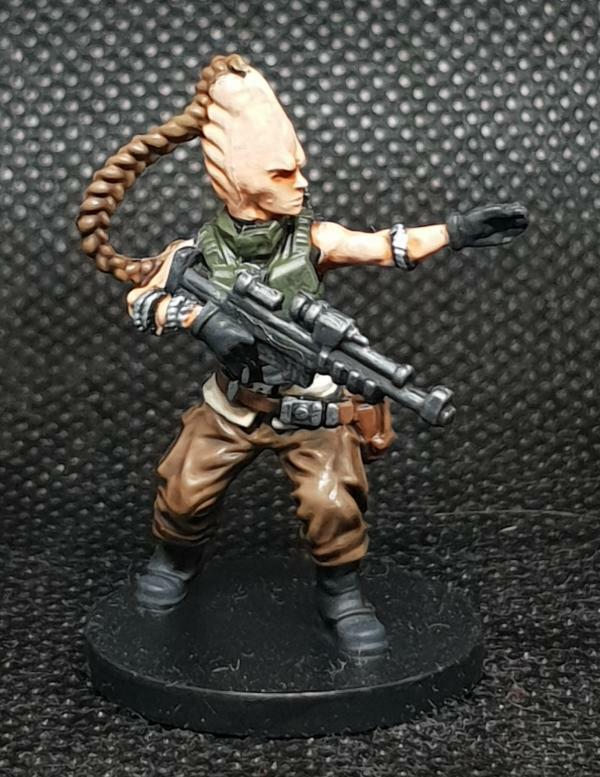 CT-1701 (Imperial Assault) - Had to get some Parasite Brown out to fix a chip, so basecoated this shoulder panel at the same time. 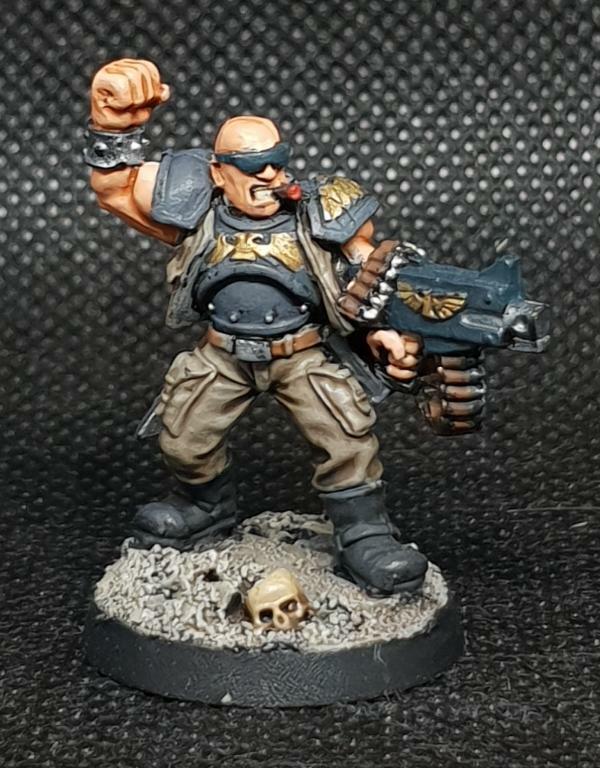 Crusader Justifier (Reaper Miniatures) - Only really started to basecoat the base on this guy today. Still need to tidy up the undercoat. Am amused by how much he appears to be over-compensating. @CommissarKhain - Best guess on getting the pods is seeing if anyone bought the plastic kit to build the Hurricane, as it doesn't use them. Alternatively, you could see if the Privateer Press bits store still has the metal parts available, but shipping can be expensive from them. Another stream down tonight, and more progress achieved. I'm still slightly behind where I need to be for the 1 model per day goal, but the project I started today should get me back on track. 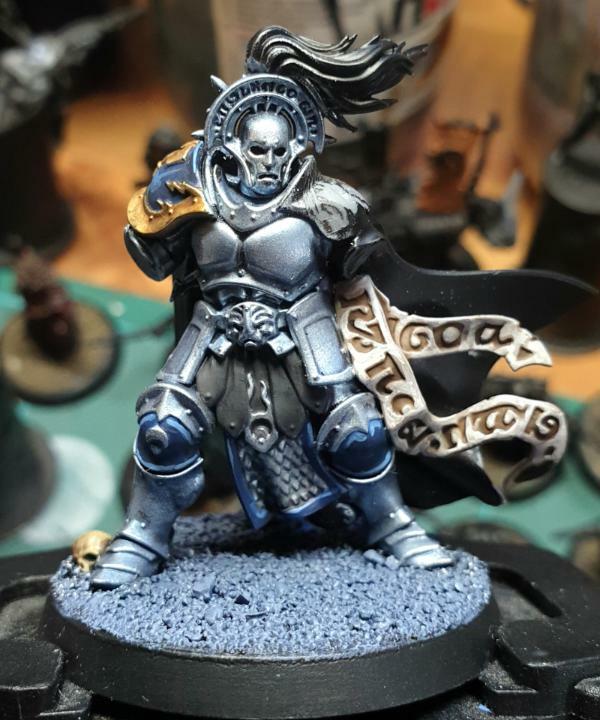 Knight-Questor - Started to work on some of the non-metallic areas on the models. 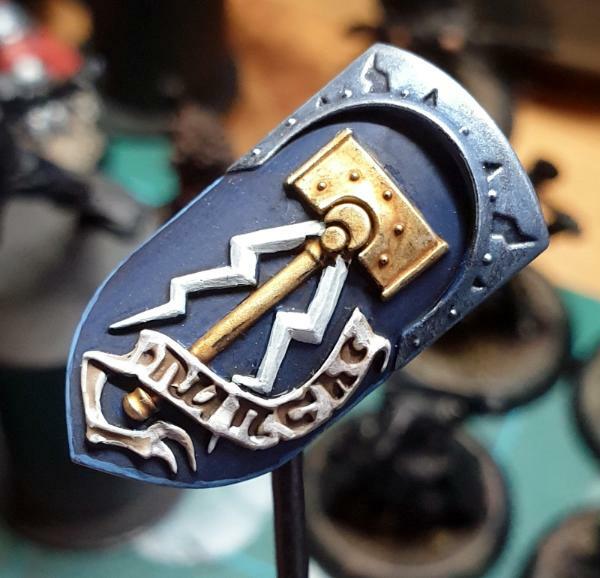 Knees, shoulderpad and shield were basecoated in Kantor Blue, then washed with Drakenhof. Random leather strappy armour was basecoated German Grey, and will get washed with Nuln Oil next time out. CT-1701 - Mostly basecoating this guy, and not overly neatly. Flesh was Midlund Flesh (and I think the beard or moustache is making his face look weird), while the armour was basecoated with Celestra Grey. Why am I painting Clone Trooper armour over a black undercoat? 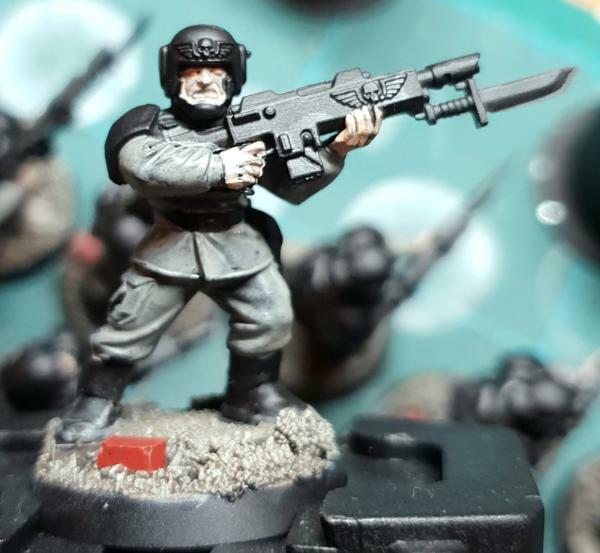 Cadian Conscripts - Yup, 10 more of these guys. 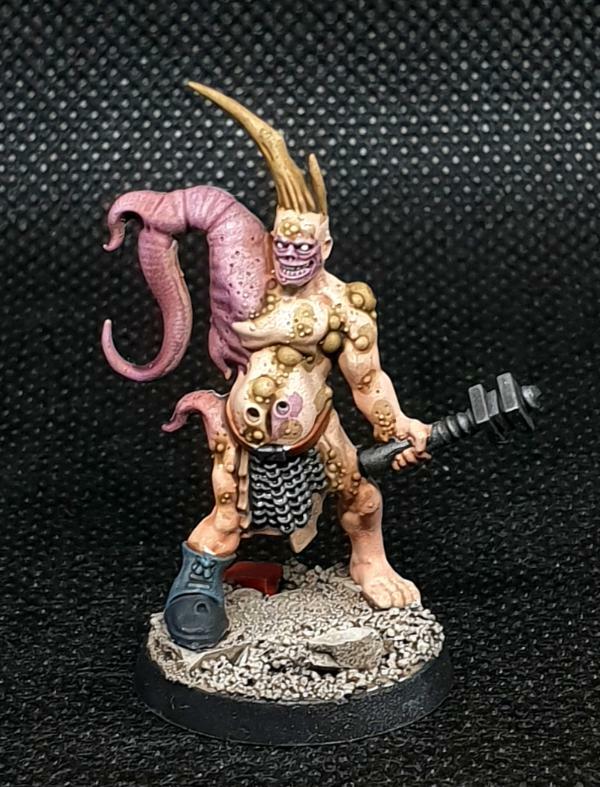 Worked up the bases as per the guide, basecoated the uniform areas with Cryx Bane Highlight (though it needs a second coat), adn the skin with Midlund Flesh (ditto). Both extra coats will be done off-camera. Dammit man, I am a painter not a machine! I have fallen to 32 (only 1 manufacturer). That Squirrel party is pretty cute...Mrs. Captain Brown would approve. @Captain Brown - Well, I'm glad to hear that Mrs Captain would approve. The downside with working on batches of ten is that you don't always get them finished off as quickly as you'd think. 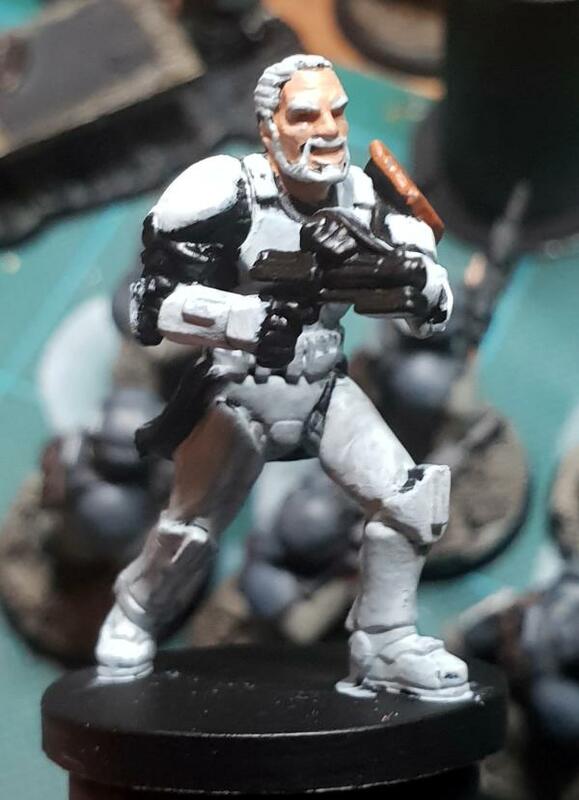 CT-1701 - washed the skin, picked out the hair/beard with Celestra, then went over the armour, hair and beard with Ulthuan. 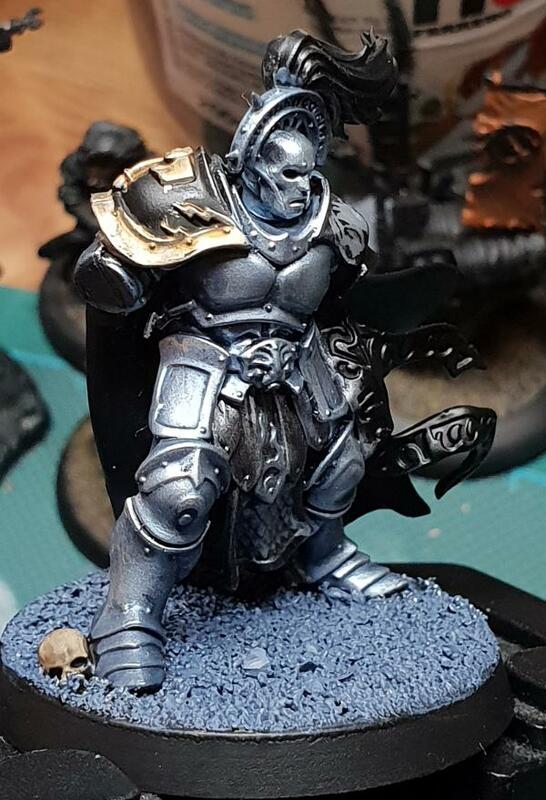 Skin needs a little touch up, and the Ulthuan probably wants smoothing out, then can use German Grey on undersuit areas. 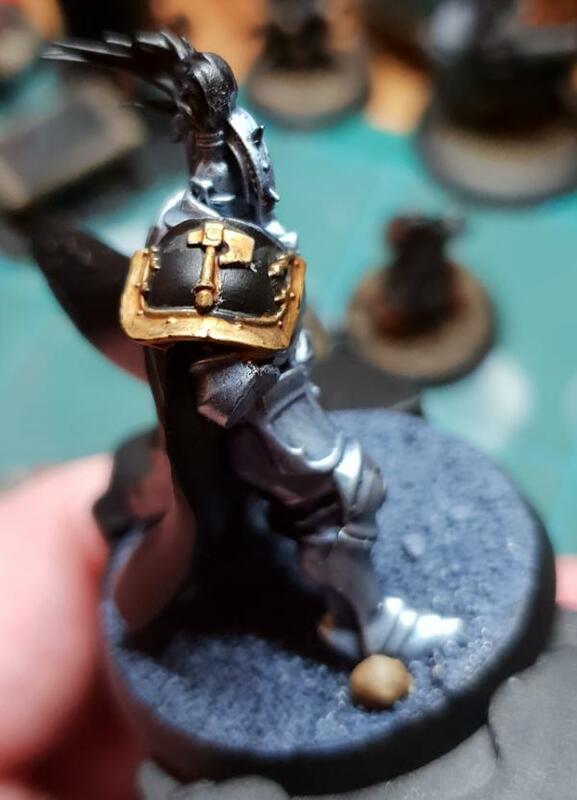 Knight-Questor - Shaded black leather strappy bits with Nuln (though a second coat may be required). Basecoated the parchment (twice) with Rakarth, then washed with Agrax. Techmarine - A new challenger appears! This guy has been waiting for that axe to be pinned back on for a while. Based and shaded the skin, and now need to find some reasonable reference pictures for him. Probably going Mentor Legion here. 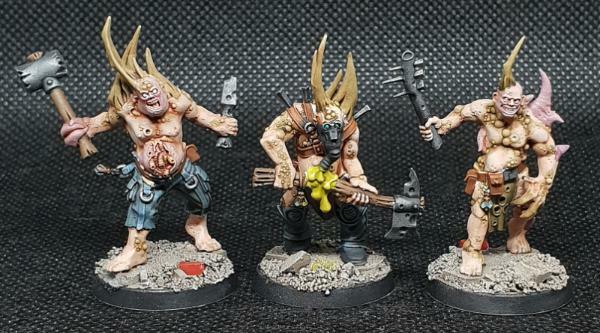 I limit myself to five at once and even that will only be for Orks and Grots...other armies it is two models at a time. Streamed again today and, while I didn't finish as much as I'd liked, I did managed to complete the Conscripts. On the other hand, I think another six can be polished off on Tuesday. 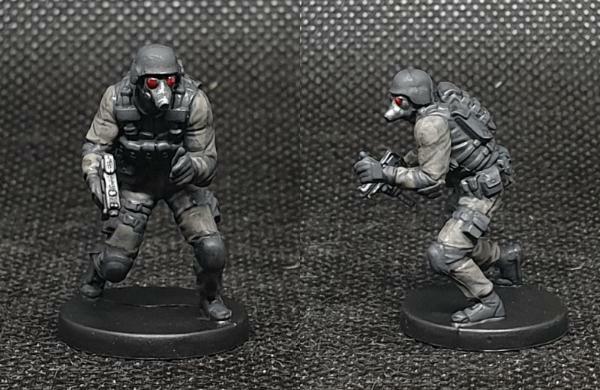 H.U.N.K - Starting with a new model, one of the Resident Evil 2 models. A log of grey and gunmetal involved so far, though it looks like I need to fix those kneepads. Might finish him on Tuesday. 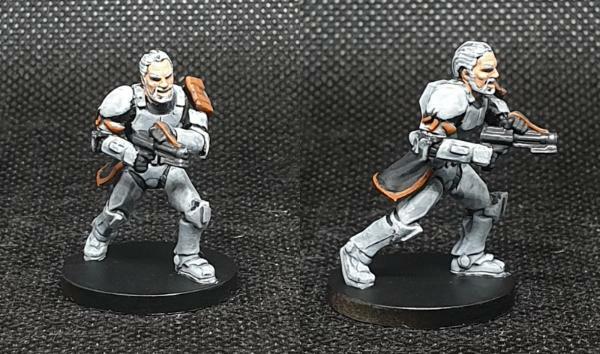 CT-1701 - Picked out undersuit sections with German Grey, washed the armour/hair with a thinned blue/black shade. 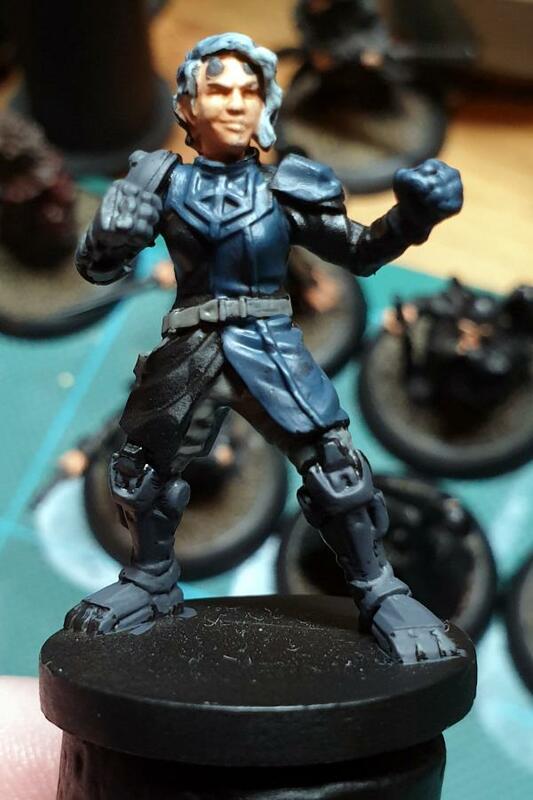 Realised I'd missed a panel on his arm, so basecoated that with Celestra Grey. Might finish him on Tuesday. 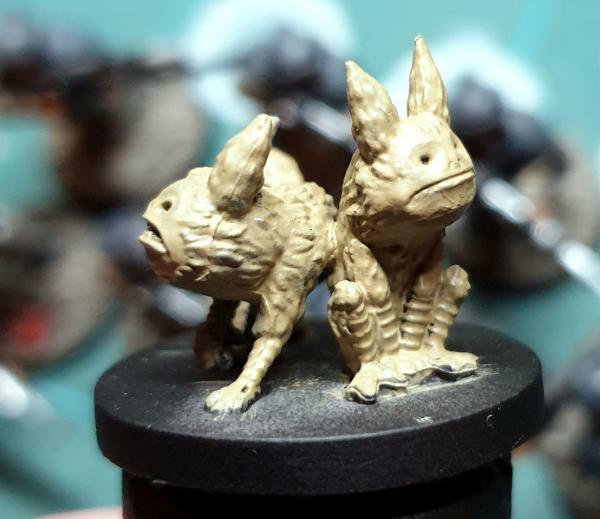 Loth-cats (4) - Started on these creatures today as well. So far, just applied two basecoats of Zandri Dust, ready to shade them next time out. Might finish them on Tuesday. Knight-Questor - Layered Pallid Wych Flesh over the parchment, seems to have worked. 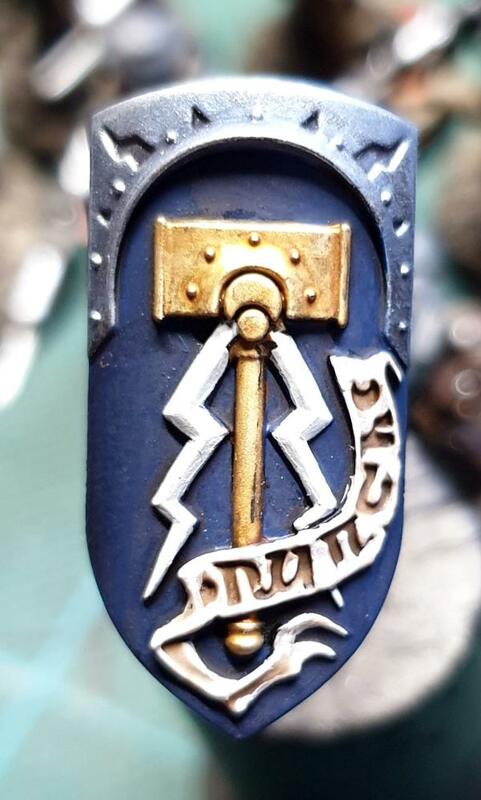 Also added the lightning bolts to the shield, with Ulthuan Grey over Celestra Grey. 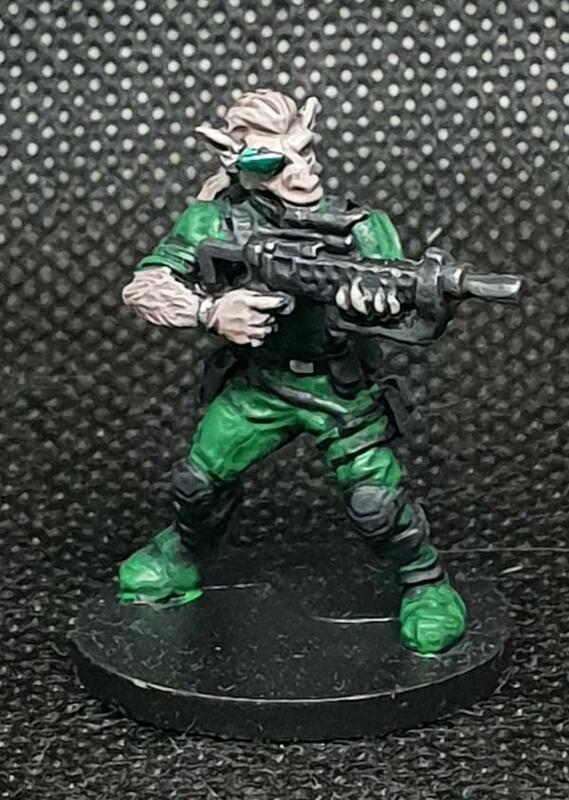 Great work on the Guardsmen. 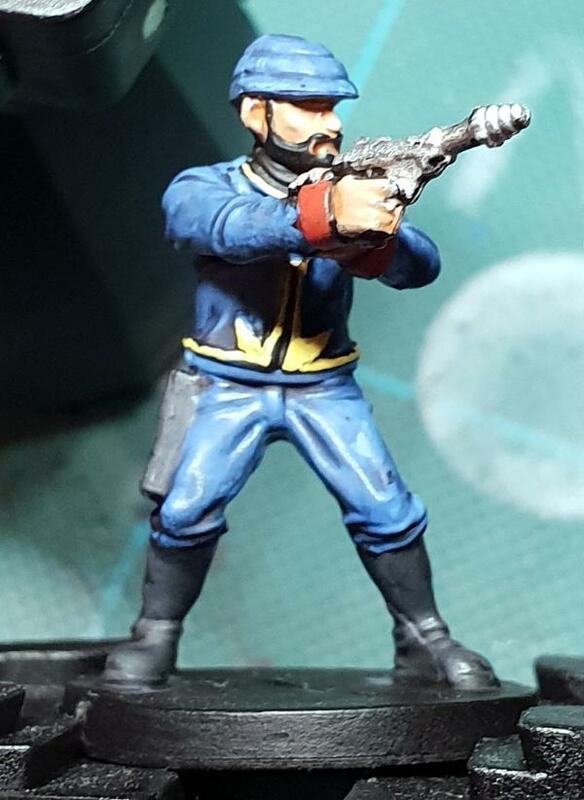 As I like to remind folks, painting Imperial Guard is a marathon and not a sprint. 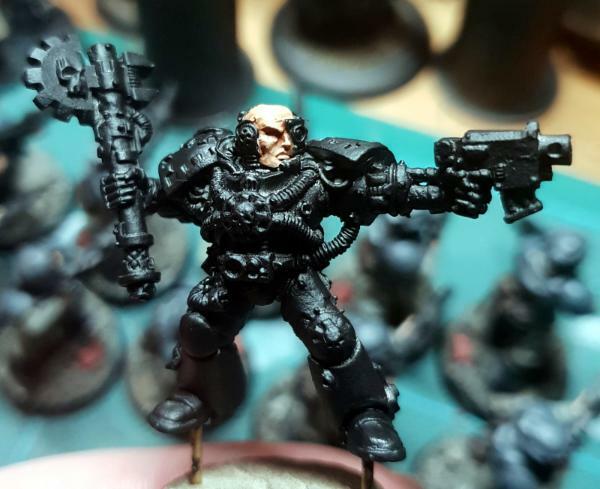 No unit markings on the Guardsmen? Love this plog and plan, totally subscribed! ddogwood wrote: People who feel the need to cheat at Warhammer deserve pity, not anger. I mean, how pathetic does your life have to be to make you feel like you need to cheat at your toy army soldiers game? 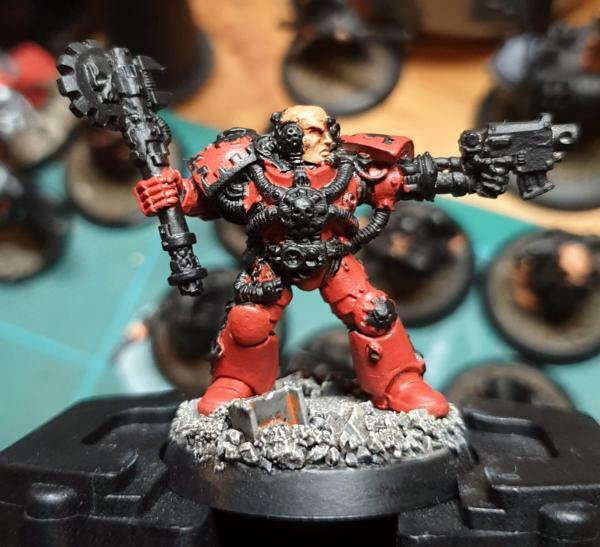 Techmarine - First pass of red ont he armour is complete. 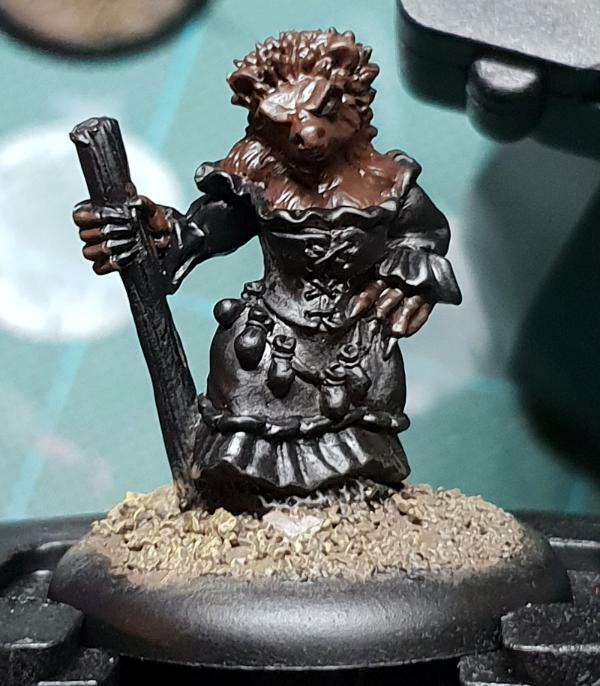 I'm using P3 Skorne Red for this, and will be applying a second coat before Thursday's stream - this would allow me to trim the pins in his feet and glue him to the base, as he does like to wobble in this cork. H.U.N.K from Resident Evil 2 - really like how the lenses came out on the gas mask. Another Thursday, another theme music stream - nothing completed tonight, but got very close with one piece, close with a second, and made decent progress on some others. Having said that, I've got a bit of a cushion from the last couple of streams (64 models vs. day 59), so I'm still ahead of the game for now. Navigator's Guild Terrain - I probably could've finished this off tonight. 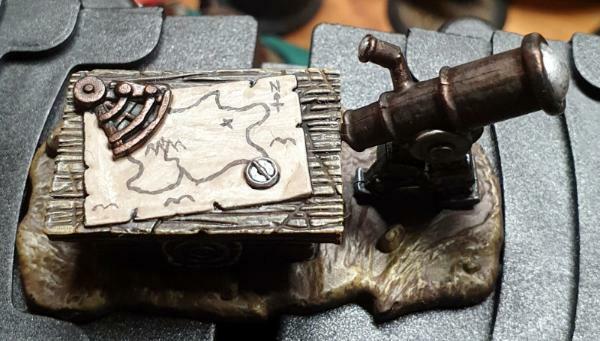 I really only need to add the blue gem technical to the telescope, but I think I'm going to go back and add sand to the base, as the drybrushing hasn't really worked. The map may want a second coat of shade to age it, too. 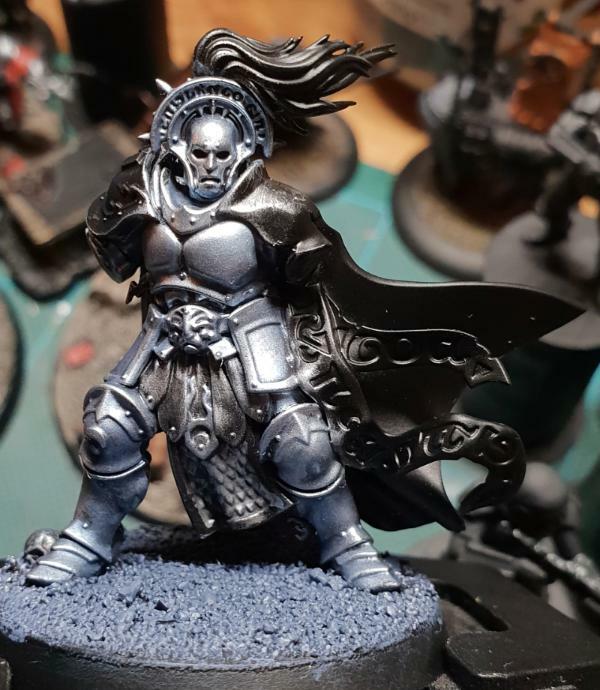 Tress Hacnua - dubbed "The Merc with a Smirk" by Twitch chat - considering she was just undercoated at the start of stream, I'm fairly happy with the progress. Hope to get her finished on Sunday. 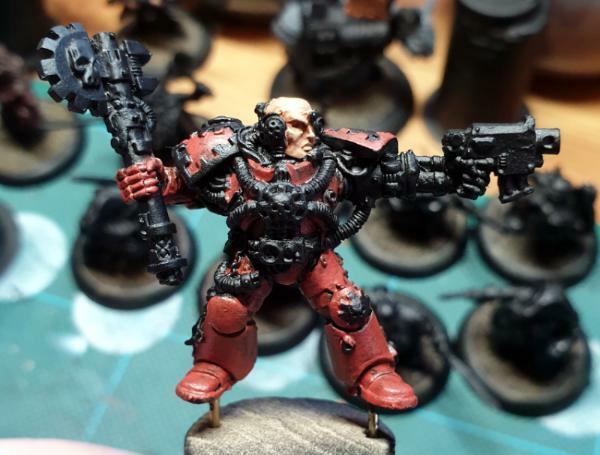 Techmarine - Got the second coat of Skorne Red down, then trimmed the pins and glued him into his base, as the wobble he had on the cork was getting irritating. Should probably start on metals next. 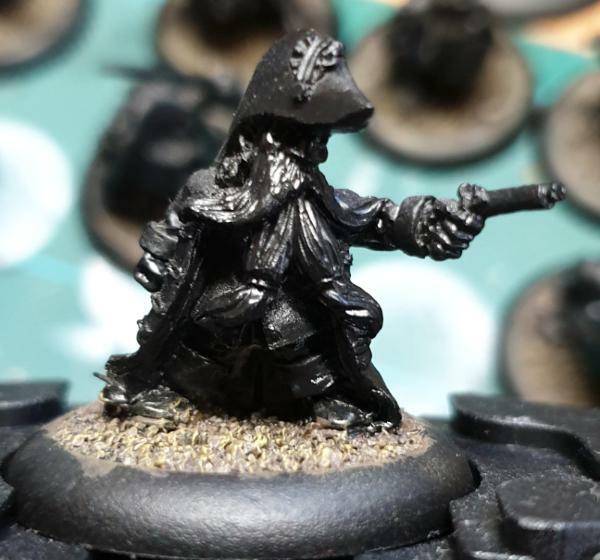 Dwarf Pirates - Eight Pirates is a reasonable amount of skin, even if they are Dwarfs. Will probably do the metals next (sword blades and pistol barrels, maybe cutlass guards as well), then split them into two groups of four and work them up that way. There may be some work on both done when working on the hair & beards, too. Next stream will be on Sunday, though I intend to get some prep work done before then.